Ex BT telephone engineer, I can install extra phone points, fix faults, solve broadband problems, improve your broadband speed, make your Wi-Fi work everywhere, Ipad and Macbook Air set up and rental, help with switching provider and install TV or satellite points. All at half the price of BT. One year guarantee. Most jobs can be quoted for over the phone. Have used Dave a couple of times now. On both occasions Dave is reliable, knowledgeable and able to solve the problems we throw at him! Would highly recommend. Dave arrived promptly for the arranged time. He was very efficient and carried out the work required quickly and neatly. 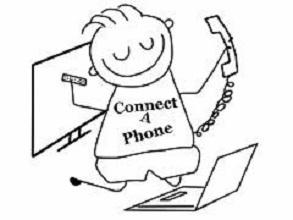 Would definitely use Connectaphone again and recommend him to others. Dave was very pleasant and helpful. David resolved all the issues we had with smart TV. Charged a fair price. Highly recommended. Excellent service, good advice, a fair price and I would use Connectaphone again. Dave gave an efficient prompt service, have now got a better telephone connection than we have had in over 30 years. I was recommended to use Connectaphone by friends who had found his work satisfactory. Made a good recommendation about the sitting of the telephone point. Did neat outside work. Slightly expensive as did not expect a call out charge. Nice man. Very knowledgeable, Dave was considerate coming into the house, taking shoes off and leaving no mess despite drilling through the house wall in two places. Everything works fine cabling very neat. Very satisfied with service from this company. Prompt courteous efficient. Costs explained and requirements discussed and agreed at start of work. Would not hesitate to recommend this trader. I found David to be very professional, extremely nice and very knowledgeable. I had a complete spaghetti junction of wires and he came and sorted everything out. He was very friendly and his price was very reasonable, he came on time and made sure the system was working before he left. I will certainly use him again and would recommend him to anyone who has a problem with sorting out telephone extensions etc. Arrived on schedule, friendly and competent, would use again. Mr Warren has worked for us before. I would highly recommend him, he gives excellent advice, value for money & does a brilliant, professional job at affordable costs. Dave turned up on time and soon found the fault and was able to replace the faulty extension socket, he also re-wired the other socket as it had been installed pre-broadband. The work was much cheaper than if we had to call out a BT engineer. Dave arrived promptly at our agreed time. He was friendly, knowledgeable and efficient in sorting out the problems I had.